What Are Rheumatologic Causes of Ankylosing Spondylitis? What Are Rheumatologic Symptoms of Ankylosing Spondylitis? What Exams and Tests Aid in the Diagnosis of Ankylosing Spondylitis? Are There Home Remedies for Ankylosing Spondylitis? What Medications Treat Ankylosing Spondylitis? What Is the Prognosis of Ankylosing Spondylitis? Ankylosing spondylitis (AS) is a type of arthritis that causes inflammation of the spine and the sacroiliac joints (joints between the lowest end of the spine, the sacrum, and the pelvis). People should seek medical care if they think they have symptoms associated with ankylosing spondylitis. Treatment of ankylosing spondylitis aims to reduce symptoms and minimize complications and typically also incorporates exercise and physical therapy. The affected joints and ligaments become swollen and painful, leading to stiffness in the back and neck. As the disease progresses, the vertebrae can fuse together, making the spine rigid and inflexible, eventually making the joints immovable. Ankylosing spondylitis can also affect other joints away from the spine as well as cause inflammation of tendons and ligaments. Ankylosing spondylitis affects a very small percentage of the population. It most commonly affects young males, but females can be affected. Females often experience a somewhat less severe form of the disease. The usual age of onset is from the late teens to 40 years of age. Some people with ankylosing spondylitis have onset of symptoms when younger than 16 years. This form of AS is referred to as juvenile-onset ankylosing spondylitis. A combination of genetic and environmental factors is believed to cause ankylosing spondylitis, but the exact cause is unknown. Studies have shown that most people with ankylosing spondylitis have the gene for HLA-B27. A person with the gene for HLA-B27 is not guaranteed to develop ankylosing spondylitis; however, having the gene increases the likelihood of developing ankylosing spondylitis. It is felt that in some people, infection of the intestines with certain bacteria (such as Klebsiella) may trigger an reaction to cause the joint inflammation in people with the gene for HLA-B27, eventually leading to the development of ankylosing spondylitis. Ankylosing spondylitis can also be associated with inflammation of the eyes (iritis) or bowels (colitis). Mouth ulcers can sometimes occur. Skin inflammation, called psoriasis, can cause patchy, scaly redness. Rarely, the lungs can be injured due to a scarring condition called fibrosis. Some people with ankylosing spondylitis can develop irregular electrical pathways in the heart. The diagnosis of ankylosing spondylitis is made by combining clinical information with findings of a variety of tests. The diagnosis is suggested by typical symptoms of ankylosing spondylitis described above, and supported by a family history of ankylosing spondylitis, x-ray film findings, and a positive test for the gene for HLA-B27. People with active ankylosing spondylitis can have elevated blood tests that measure inflammation, such as the erythrocyte sedimentation rate (ESR) and C-reactive protein. Blood counts can indicate anemia (low red blood count). If symptoms are present, and the gene marker for HLA-B27 is detected on blood testing, ankylosing spondylitis is considered. Of note, the absence of the gene marker for HLA-B27 means that ankylosing spondylitis is less likely to be present. However, blood relatives of people with ankylosing spondylitis could have the condition without having the HLAB27 marker. X-ray examination of the spine of people with ankylosing spondylitis can reveal characteristic bony changes in the sacroiliac joints and the spine. MRI or CT scan can be used to detect early signs of inflammation in the sacroiliac joints and the spine that may not be visible with simple x-ray tests. However, because of their high cost, MRI and CT scans are not part of the routine examinations of people with suspected ankylosing spondylitis. The goals of treatment of ankylosing spondylitis are to reduce pain and stiffness, to prevent deformities, to maintain normal function, and to minimize complications. Treatment of ankylosing spondylitis includes exercise and physical therapy to help improve posture and spinal mobility. Medical treatment is used to reduce inflammation and pain, to prevent joint damage, and to stop progression of the disease. Practice good posture in order to keep the spine straight. Sleep in a prone position (on the abdomen) without a pillow. Sleep in a supine position (on the back) with a thin pillow. Keep the legs straight when sleeping, not supported by a pillow. Do not sleep in a curled-up position. When walking or sitting, keep the spine as straight as possible. Use chairs and work surfaces specially designed to support the spine. Regular exercise is an essential part of the treatment of ankylosing spondylitis. Exercises that strengthen the back and neck can help maintain correct posture. Aerobic exercises, such as swimming, are very helpful because they promote flexibility of the spine and movement of the shoulder and hip joints. A hot shower before exercise often relieves some joint pain and stiffness and makes exercising easier and less painful. Exercise should be started slowly and performed when pain is minimized. Nonsteroidal anti-inflammatory drugs (NSAIDs) are the most commonly used medications. NSAIDs do not cure ankylosing spondylitis, but they reduce the pain and stiffness of ankylosing spondylitis. Commonly used NSAIDs include diclofenac (Cataflam, Voltaren), ibuprofen (Advil, Motrin), ketoprofen (Orudis), naproxen (Aleve, Naprosyn), piroxicam (Feldene), etodolac (Lodine), indomethacin, oxaprozin (Daypro), nabumetone (Relafen), and meloxicam (Mobic). People with ankylosing spondylitis respond differently to each of the many NSAIDs available. It is well known that an NSAID that works for one person may not work for another person. Be patient and actively participate in deciding which NSAID provides maximum relief. Side effects of NSAIDs include heartburn, nausea, abdominal pain, diarrhea, and bleeding ulcers. To decrease the risk of stomach upset, NSAIDs should be taken with food. Sometimes, taking antacids or other medicines may be necessary to prevent heartburn and ulceration caused by NSAIDs. Sulfasalazine (Azulfidine) has been shown to reduce the pain and stiffness of ankylosing spondylitis, especially of peripheral joints (such as the hips and shoulders). Potential side effects include rash, nausea, and diarrhea. A rare but serious side effect is a severe reduction in the number of white blood cells, which predisposes the individual to life-threatening infections. Blood counts can be monitored with blood testing. Newer medications, called biologics, work by altering critical messengers of inflammation. Biologics that block tumor necrosis factor (TNF)-alpha (a substance that plays a role in the inflammatory process of ankylosing spondylitis) can be extremely effective in treating ankylosing spondylitis. Examples of TNF-alpha blockers include etanercept (Enbrel), adalimumab (Humira), and infliximab (Remicade), golimumab (Simponi), and certolizumab (Cimzia). Etanercept, adalimumab, golimumab, and certolizumab are administered as injections. Infliximab is administered as an intravenous infusion. Other biologics for treating adults with ankylosing spondylitis include those that intercept a chemical messenger of inflammation called interleukin 17. An example of one such biologic currently approved for use in adults with ankylosing spondylitis is secukinumab (Cosentyx), which is given by subcutaneous injection. Other medications such as methotrexate (Rheumatrex), azathioprine (Imuran), cyclophosphamide (Cytoxan), and cyclosporine (Sandimmune, Neoral) may be helpful in the treatment of ankylosing spondylitis, especially when peripheral joints are involved. They are prescribed only if NSAIDs are not effective in controlling the symptoms of ankylosing spondylitis. Each has specific potential toxic side effects that require monitoring, including regular blood testing. Oral corticosteroids, cortisone medications such as prednisone, are occasionally helpful in temporarily controlling symptoms. However, they are generally used for only short-term management. For more information, see Understanding Ankylosing Spondylitis Medications. Surgery is occasionally used to repair damaged peripheral joints or to correct spinal deformities. 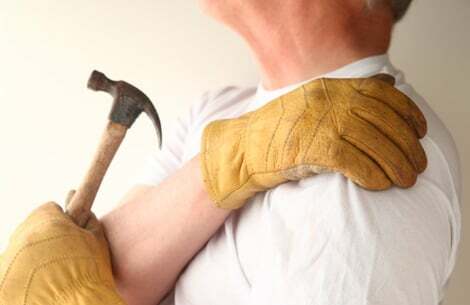 Examples of joint repair surgery include total hip replacement and total shoulder replacement. These procedures may reduce pain and improve function when the hip and shoulder joints become severely damaged. Rehabilitation therapies are important in the treatment of ankylosing spondylitis. Proper sleep and walking postures, together with abdominal and back exercises, help maintain correct posture. Exercises help maintain joint mobility. Physical therapy is not believed to prevent the progression of ankylosing spondylitis, but it may minimize symptoms. The course of ankylosing spondylitis may change over time, with periods of relapses and remissions. The outlook of most people with ankylosing spondylitis is generally good. Fortunately, few people with ankylosing spondylitis become severely disabled, particularly with the newer treatments now available. Long-term therapy with NSAIDs is usually required. Yu, David T. "Assessment and Treatment of Ankylosing Spondylitis in Adults." August 2018. UpToDate.com. <https://www.uptodate.com/contents/assessment-and-treatment-of-ankylosing-spondylitis-in-adults>. Yu, David T. "Clinical manifestations of ankylosing spondylitis in adults." August 2018. UpToDate.com. <http://www.uptodate.com/contents/clinical-manifestations-of-ankylosing-spondylitis-in-adults>. What rheumatologic complications have you experienced with ankylosing spondylitis? Please share your experience with ankylosing spondylitis.